These numbers suggest that this faster payments option that enables same-day processing of virtually any ACH payment will meet the growing demand to move money and information more quickly. The Electronic Payments Association®, the steward and rulemaker of the ACH Network, today released initial transaction volume data for newly implemented Same Day ACH debit transactions, demonstrating strong performance and adoption for this faster payments option in its first 11 processing days of operation from Sept. 15-30, 2017. Same Day ACH for debits had an immediate impact on how consumers and businesses make payments. Volume reports show that nearly 2 million Same Day ACH debits were made, equating to an average of more than 178,000 per processing day. The estimated total value of the initial transactions was nearly $1.5 billion, with an average of $650 per payment. Over the same time period, nearly 94 percent of transactions were consumer-to-business debits, with business-to-business payments making up the remaining payments. The launch of Same Day ACH for debits builds on the strong foundation established with the launch of Same Day ACH for credit payments on Sept. 23, 2016, expanding the innovative payments solutions available for consumers, businesses and financial institutions. Total Same Day ACH volume for both debits and credits is now up to nearly 40 million transactions in 2017 and nearly 53 million total transactions since inception in 2016. The average daily volume for the 11 processing days for which Same Day ACH credits and debits were both live yields an annualized estimate of more than 100 million transactions. 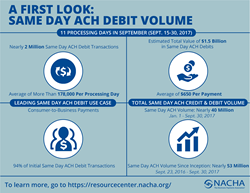 An infographic detailing Same Day ACH debit volume is available for download on the NACHA website. For more information about Same Day ACH and how others are leveraging this faster payments innovation, watch the video here and visit NACHA’s Same Day ACH Resource Center at https://resourcecenter.nacha.org/. Future volume and value data information pertaining to Same Day ACH, for both credit and debit transactions, will be released as part of NACHA’s regular ACH Network statistics updates.